Airbrush Artists for parties, We custom Airbrush on T-shirts, Snap backs, Hoodies, Tote bags, Beanies, Towels, Converse, UGG Boots and more! 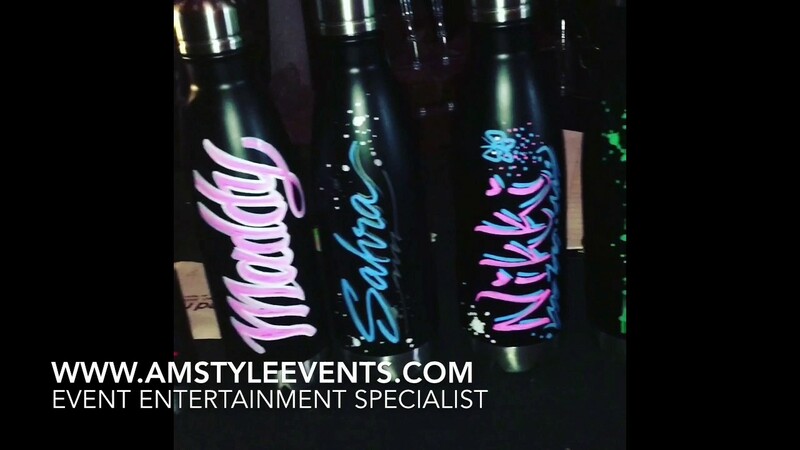 Now offering "Custom water bottles" Exclusively by AM Style ENT. All custom freehand artwork by our talented designers, The quality of artwork will stand out like no other. We are Los Angeles Best Event Entertainment Company! All your artistic event services in one place. Featuring some of the top named Airbrush and Graffiti Artists in the industry. Established since 2007. Airbrush Artists, Caricature Artist, Green Screen, Photo booth, and more! A.M style was absolutely amazing. Proffesional and had amazing work. I highly recommend them. I would definitely use them in the future and refer them to all my friends. Thank you Shadi for booking our services as a package for your event. Your Venue at The Beverly Hills Hotel was amazing and the your guest were wonderful! Once again thank you for the wonderful review. Just wanted to take the time to send this note to thank you for helping make our event such a success. Everyone on your team was such a pleasure to work with. The artists stole the show with their onsite customization of our product. Definitely hope to work together again in the future. Let us know if you ever need anything from our end as well. A.M. Style did a fantastic job at a Bat Mitzvah I planned. They were so friendly and professional and fun to work with. Would definitely hire them again and recommend to friends and clients! Thank you Alison! It was a pleasure working with you throughout the planning process as well! We appreciate your feedback and looking forward to many more events to come. Thanks again! These guys are so great to work with. Whatever I need - not a problem. They are very artistic and make my clients extremely happy. Would not hesitate to continue to use them!! They were fantastic! Kids and adults loved them. I highly recommend and will use them again and again! We had the pleasure of hiring Am Style for our HBO Luxury Lounge this past January. Jessika and her team were beyond professional. They showed up on time, kept a clean area, and most importantly their designs were a HIT. We highly recommend hiring them for your next event. The tattooing was a huge hit at our son's birthday party. Daniel was great with the kids (and adults) and he's very talented. Everyone loved what he did. We'd definitely recommend you to our friends. The artists were fantastic. Everyone loved it! Am Style painted flip flops and phone cases for our party. Each one was unique and painted specially for each guest. the guests loved their party favors and the artists were diverse and talented. I was so impressed with the communication and professionalism of the company. I would use them again for any event. Wendy, It was a pleasure providing our services for your daughters Bat mitzvah. I thank you for the review and hope to be of service to you again in the future. 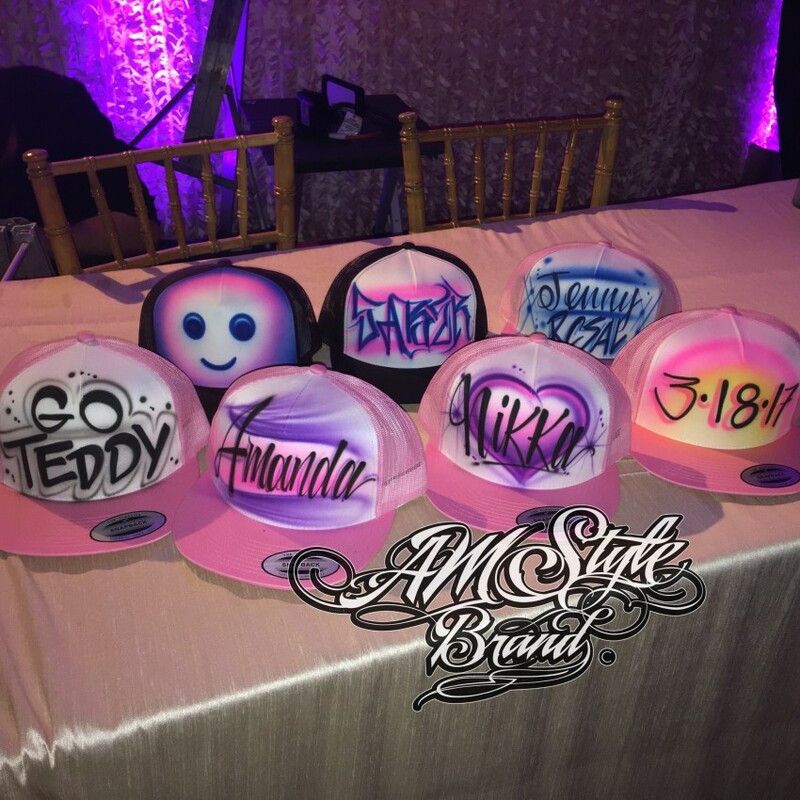 AM STYLE airbrush is a one-stop shop for your party. Jessika took care of everything, they were highly professional. The kids and adults loved the merchandise and when my son was very busy enjoying his party and didn't take time to get something for himself, Jessika had the guys make him a hat, etc..She gave it to me at the end of the party...Very thoughtful. Thanks AM Style, we'll see you again soon!! Fabulous Company! Would use them again in an instant! I found A.M. Entertainment online when I was serching for a company to do something for our annual Art Fair which is a school fundraiser. They were awesome to work with and the kids loved their items. We will totally use them again next year! I was really stressed out for my sweet 16! One month before my party i chose to have someone come do airbrush tattoos! It's something i've always wanted at my party. I emailed them and they quickly responded with the information i needed. They were very patient (i was having trouble with internet and gave the deposit a few days after i told them i would). Closer to my event, they confirmed with me and it was all set! On the day of my party he showed up on time and did an amazing job. He was very sweet and friendly. I think his name was Gabe. My guests loved him and still talk about it :) i recommend this to everyone! I've used A.M. Style three times now and cannot say enough great things about them. The first two times they airbrushed on t-shirts, and the third time on t-shirts and tote bags. They are professional, courteous, and always do an amazing job that impresses kids and adults alike. I plan to use them again for future parties and highly recommend them. For the second time in 2 1/2 years, I used them for our child's Bat Mitzvah event. This time, I was going to get my t-shirts separately but couldn't find any at the last minute. I called them the night before the event, and they totally had me covered - picking up some for me when originally we all planned not to do that. Very nice of them to be so flexible and to bail me out of a jam like that. They were very professional and organized - which not all creative vendors are. They showed up on time and did great work - the kids gobbled up their work as fast as they could do it. I would highly recommend working with Jessika and her team. We hire AM Entertainment to airbrush over 300 converse low and high top sneakers. The team was professional, courteous, organized and a true delight to work with. They worked for 6 hours straight - no stopping and no complaining. They were truly extraordinary! We hired them to make airbrush towels as the favor for my daughters birthday and everyone was so impressed! The team were friendly, professional, and creative! Would absolutely hire them again! Thank you Jane it was a pleasure meeting you and providing our artistic services for your party. I have used A.M. style for two bar mitzvah parties. They do an amazing job with out of the ordinary airbrush clothing and tattoos. They are professional, prompt and deliver exactly what they promise. I would highly recommend them. Professionalism & Creativity at its best. 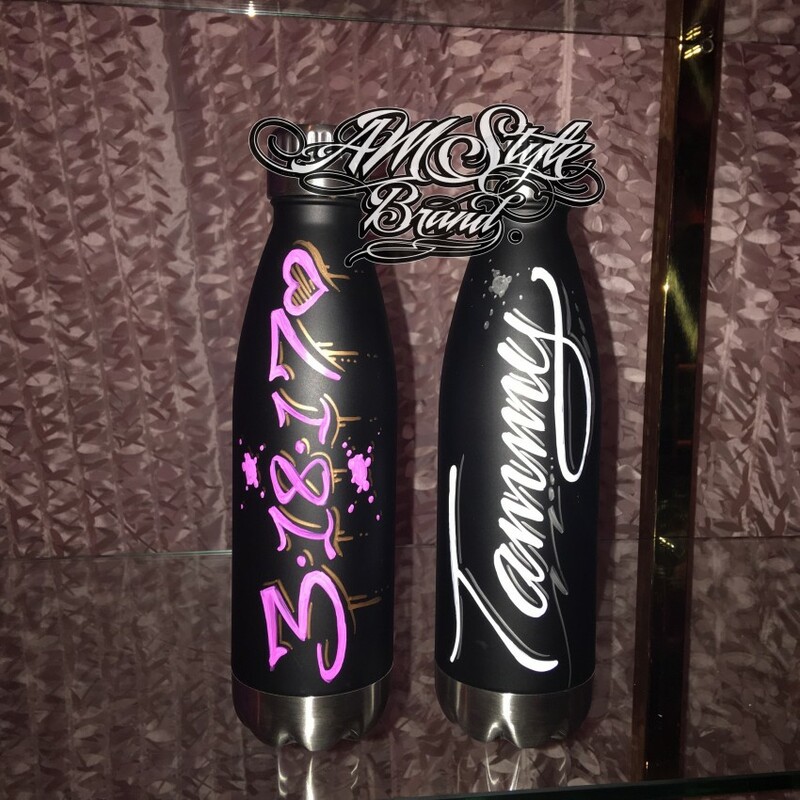 *NEW "Custom Water Bottles" Exclusively by AM Style ENT. You name it we can airbrush it! Just contact us for more information! Dont settle for less, we offer the best! 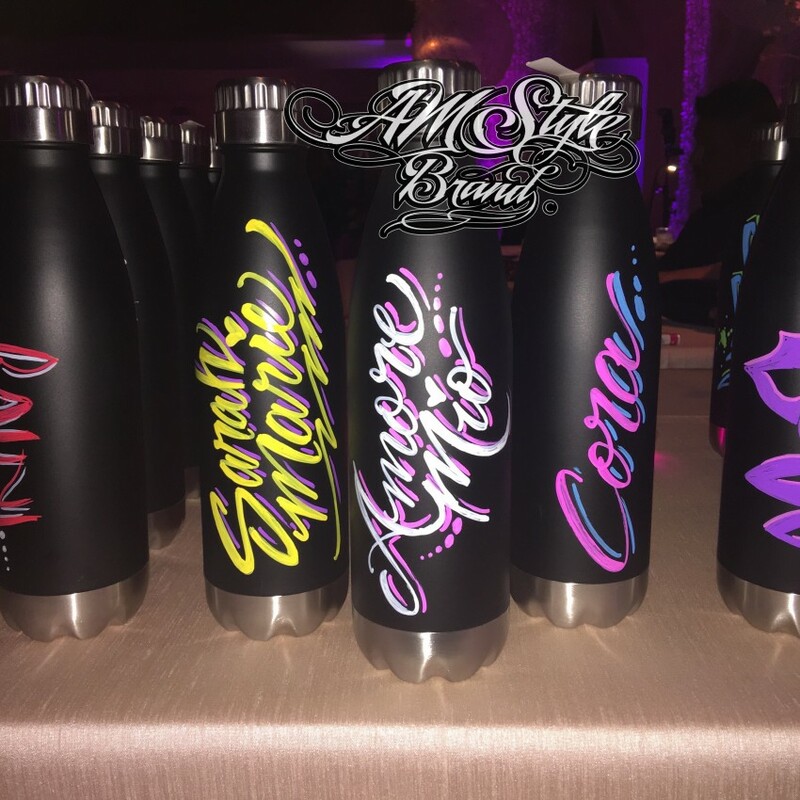 Based in Los Angeles, California, A.M Style Entertainment established since 2007, provides full party services including: Airbrush artist for parties, Grafitti Art on IPhone cases, Green Screen photography, High Defination Digital or Caricatures designs, Airbrush Tattoo Artist. We create unique and freestyle designs, No stencils! We provide the highest in professionalism and quality airbrush entertainment in the industry and we only use the best products that are made to last. We are fully insured! We provide package deals for each unique event.. Book two or more of our services and get a discount!